Here’s a rare find: a JDM (Japanese Domestic Market) Toyota Hilux Quadcab Pickup. The engine is a 2.8-liter diesel, mated to a 5-speed manual, and a 2-speed transfer case. Four doors, a short bed, and the seller claims this is the commercial model of this truck. Maybe that’s why the ad mentions a factory solid front axle? What’s not to love? Well, Japanese market means right-hand drive. Also it’s for sale in Canada and still a year away from legal import status to the United States. Upgrades include diff breathers and an Old Man Emu (OME) suspension, dampers, and bushings. 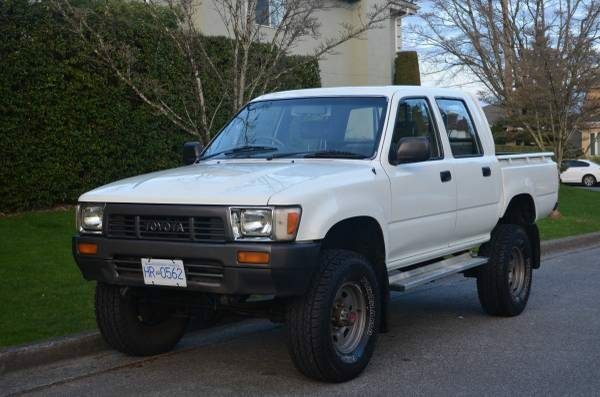 The truck has 189,000 km on the clock, sounds to be well maintained, and can be found on Craigslist in Vancouver for CAD$19,000.